Played in five games for the Suns at NBA Summer League 2015 in Las Vegas, helping the team to a runner-up finish by averaging 10.8 points, and team-highs of 9.8 rebounds and 2.2 blocks in 24.4 minutes… Had a breakthrough second season with the Suns, emerging as one of the league’s best young shot blockers and averaging 6.3 points (50.7 FG%, 70.2 FT%), 6.6 rebounds, 1.5 blocks (18th in NBA) and 22.0 minutes in 69 games (44 starts)… Ranked seventh in the NBA among qualified players with 2.5 blocks per 36 minutes… In 44 starts averaged 6.9 points (49.8 FG%, 66.7 FT%), 7.7 rebounds, 1.9 blocks and 24.2 minutes as the Suns posted a 23-21 (.523) record in those games… After entering starting lineup on Dec. 15, averaged 1.9 blocks, t-8th most in the NBA past that date… Scored in double-digits 18 times, had double-digit rebounds 16 times (led team) and posted 10 double-doubles, including five in 18 games after the All-Star break… With 10 double-doubles before his 22nd birthday, joined Amar’e Stoudemire (46) and Alvan Adams (36) as the only Suns to have at least 10 with the team before turning 22… Recorded six games with at least five blocks and 10 games with at least four blocks, the most by a Sun since Amar’e Stoudemire had 15 in 2007-08… Six games with at least five blocks all came in the final 52 games of the season; prior to those 52 games, any Suns player had five-plus blocks six times in the previous 185 games… Led team in rebounding eight times, steals six times and blocks a team-high 36 times… Had doubledigit rebounds in a career-long five straight games from Feb. 20-26… On three occasions had 10+ points in two-straight games… Recorded consecutive double-doubles for the first time in his career with 14 points and a career-high 13 rebounds at Memphis on Jan. 11 then 13 points and 10 boards (as well as a career-high three assists) vs. Cleveland on Jan. 13… Scored a career-high 19 points, making a career-high eight field goals in addition to seven rebounds at Boston on Nov. 17… Set a career-long with his fifth straight game of 10+ rebounds with 12 points, 11 rebounds and three blocks in a career-high 38 minutes vs. Oklahoma City on Feb. 26… Had a double-double with 10 points and 12 rebounds and a career-high-tying six blocks vs. Boston on Feb. 23; the second time with a double-double and six blocks in three games after posting 11 points, 10 rebounds and six blocks at Minnesota on Feb. 20… First set his career-high of six blocks vs. Philadelphia on Jan. 2… Had first career double-double and first career double-digit scoring with 10 points and a then-career-high 11 rebounds vs. San Antonio on Oct. 31… Recorded a career-high four steals at Indiana on Nov. 22… Made first start of season (fourth career) with six points and six rebounds vs. Milwaukee on Dec. 15… Had a career-high and tied a Suns season-high with six offensive rebounds vs. Sacramento on March 25… Missed six games to a sprained right ankle (Feb. 6-10, March 7, March 15-19) and the final seven games to a broken nose (April 2-14). Appeared in 42 games (three starts) in his rookie NBA season, averaged 2.0 points, 2.4 rebounds and 0.4 blocks in 8.6 minutes... Tied career-high with nine points and made career-high four field goals vs. Orlando on Mar. 19… Played nine minutes (all in fourth quarter) and had six points including go ahead tip-in and-one to give Suns lead for good on Mar. 14 at Boston… Made first career start and had six points and six boards in 19 minutes vs. L.A. Clippers on Mar. 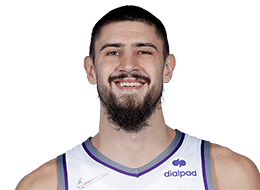 4... Had first career game with 10+ rebounds (10) in addition to seven points at Milwaukee on Jan. 29… Posted career-highs with nine points, six rebounds and 16 minutes vs. Denver on Jan. 19… Assessed a Flagrant 2 Foul and ejected after foul on Nick Young vs. L.A. Lakers on Jan. 15… Played six minutes and had three points in first game after missing 21 at Chicago on Jan. 7… Played five minutes and recorded a steal and assist at Sacramento on Nov. 19 in his first game since the second game of the season after missing seven games to a sore left ankle… Made NBA debut in season opener vs. Portland on Oct. 30, scoring two points, grabbing two rebounds and blocking one shot in eight minutes. Selected by the Suns with the fifth overall pick of the 2013 NBA Draft… Signed with Suns on Aug. 29, 2013. Two-year performer at Maryland, averaged 9.7 points, 7.0 rebounds and 2.08 blocks in 60 career games (48 starts)… Had 32 career double-digit scoring games and seven career double-doubles… Named honorable mention All-ACC and to the All-ACC Defensive Team as a sophomore in 2012-13… Selected to the USBWA All-District III Team… Led the ACC with 78 blocks and 2.1 blocks per game as a sophomore… Ranked second on the team with 11.9 points and fifth in the conference with 7.8 rebounds per game in 38 contests… Scored in double figures in 26 games and recorded six double-doubles… Tallied a career-high 23 points in addition to 12 rebounds in season opener against No. 3 Kentucky on Nov. 9, 2012… Hit the game-winning shot to give Maryland a 51-50 victory over NC State, scoring on a tip-in with 0.9 seconds left… Blocked a career-high six shots in the NIT semifinal vs. Iowa, while posting 16 points and nine rebounds… Averaged 6.0 points, 5.4 rebounds and 2.14 blocks in 22 games as a freshman in 2011-12… Ranked third in the ACC in conference games only with 2.2 blocks per game… Had 14 points, eight rebounds and three blocks in collegiate debut vs. Albany on Dec. 28, 2011… Posted first career double-double with 12 points and 11 boards in ACC debut at NC State. NATIONAL TEAM: Represented Ukraine at the 2010 FIBA Europe U18 Championship… In nine games, averaged 16.0 points (4th highest at competition), 11.4 (2nd), 4.3 blocks (1st) and 1.7 steals (13th) in 29.0 minutes… Nearly recorded a triple-double with 20 points, 17 rebounds and nine blocked shots vs. Germany… Posted 24 points and 20 rebounds in a win over Sweden… Also represented Ukraine at the 2009 FIBA Europe U16 Championship… Averaged 8.0 points, 4.8 rebounds and 2.6 blocks (2nd highest at competition) in 18.6 minutes in five games.